NEW YORK -- The NYPD said Wednesday it was aware of a newly-released ISIS video that makes reference to Times Square, but also said there was no specific threat to the city. CBS New York reported the video, which was posted by several sources Wednesday afternoon, began with footage of French President François Hollande following the terror attacks in Paris last Friday, along with remarks from militants. 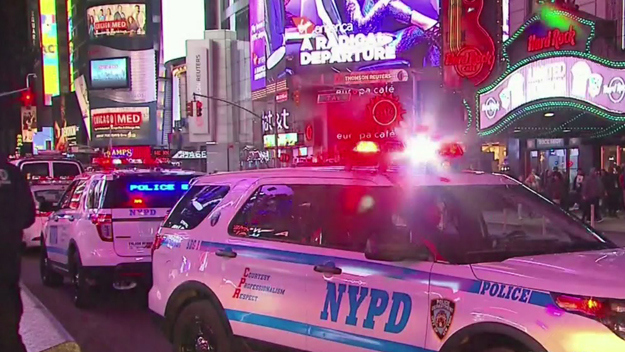 In what appeared to be a threat directed at the U.S., Times Square was shown along with New York City taxis and several Midtown locations, interspersed with what appeared to be a man preparing an explosive device and strapping it to himself. The video does not show a suicide bomber or militant in New York. The NYPD said it was aware of the video, and will remain vigilant. "It is the goal of terrorists to intimidate and disrupt our democratic society," New York Mayor Bill de Blasio said during a news conference late Wednesday night. "We will not submit to their wishes." De Blasio emphasized "There is no credible and specific threat against New York City." "There is, as we have repeated frequently, no city in America that is better prepared to defend and protect against a terrorist attack," police commissioner Bill Bratton said. Bratton said the video appeared to be "hastily produced" and was "a mishmash of previously released video." "In New York, we understand that we are a terrorist target, it reflects the importance of this city," Bratton said. "Understanding that, this city places great importance on the safety of New Yorkers and the almost 60 million visitors who will come to this city." De Blasio emphasized that on Monday, the NYPD unveiled a new counterterrorism squad. Officials said the officers have received elite training in what amounts to armed warfare against any terrorist who would try to hit New York City. By the end of the year, there will be 560 members in the unit, which will be up and running by New Year's Eve. "Be aware, but do not be afraid. The NYPD will protect you. The NYPD, working in close, close cooperation with the FBI and our other government parties, and with the great, great assistance of the residents of this great city, that we will keep it safe," Bratton said. "We cannot be intimidated, and that's what terrorists seek to do. They seek to create fear. They seek to intimidate. We will not be intimidated, and we will not live in fear." "While there is no current or specific threat to the City at this time, we will remain at a heightened state of vigilance and will continue to work with the FBI, the Joint Terrorism Task Force and the entire intelligence community to keep the City of New York safe," NYPD Deputy Commissioner of Public Information Stephen Davis said in a statement earlier Wednesday. "In addition, we are continuing to deploy additional Critical Response Command (CRC) teams throughout the City, out of an abundance of caution." The FBI released a statement echoing that "there is no specific articulable threat to the city at this time" and that the Joint Terrorism Task Force "continues to vigilantly work with NYPD and our other law enforcement partners to keep our community safe and fully investigate any threat information." In the days since the Paris attacks, New York authorities report an increase in calls to 911 about such things as suspicious behaviors and abandoned bags and packages.